Yes Astron-6 those crazy people who made such films as 'MANBORG' and FATHERS DAY (which you can read the review right here) are back. This time they bring their own magical touch to 'THE EDITOR', in their own words "a love letter to the Italian Giallo movies of the 1970's and 80's". Directed by Adam Brooks and Matthew Kennedy their aim is simple, pay homage to the masters such as Argento and Bava and add in their own distinct style of film making. 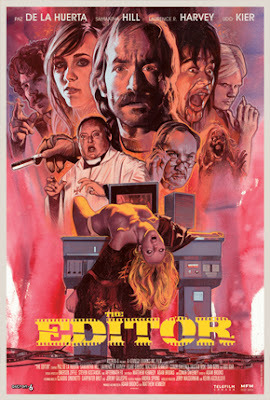 With a cast that includes Udo Kier (Suspiria, Blade, Iron Sky) and Laurence Harvey (The Human Centipede 2 & 3) with the talents of Claudio Simonetti (Dawn Of The Dead (1978), Profondo Rosso) composing, Astron-6 have a huge amount of talent on board for 'THE EDITOR'. Scream Factory will be releasing Astron-6's 'THE EDITOR' on Blu-ray/DVD on 8th of September (U.S. ONLY) and if you purchase directly from them NOW you will also get a double-sided poster FREE (while stocks last). So what you waiting for, go here and buy the film now. Be sure to 'LIKE' Astron-6 on Facebook to keep up with all their projects.